J.J. Redick is the NBA’s new 3-point king. Sort of. Steph Curry failed to splash a 3 against the Los Angeles Lakers on Saturday night, ending his record streak of games with at least one from long distance at 157. The two-time MVP went 0 for 10 from deep in a surprising loss to the Lakers. That made Redick the new leader for longest active 3- point streak at 61 games. Not even 100 more games to go. Actually, Curry made a 3- pointer in 196 straight games when the playoffs are included. And while it’s been said that all good things come to an end, the best shooter in the world sounded like he had reasonable expectations of keeping his streak alive for years. The last time Curry went splashless was Nov. 11, 2014, when he went 0 for 7 in a loss to the Spurs in San Antonio. His run surpassed Atlanta Hawks forward Kyle Korver’s 127 straight games. The second-longest active streak now belongs to Indiana’s Paul George at just 27 games. Curry’s first chance to start a new streak comes Monday against the win- less New Orleans Pelicans. And you can bet he will make one. 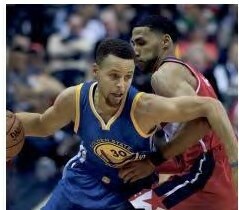 The last time Curry went two straight games without a 3 came Nov. 14-16, 2012, when he went a combined 0 for 8 against Atlanta and Minnesota. It’s only happened three other times in his career, and one was health related.